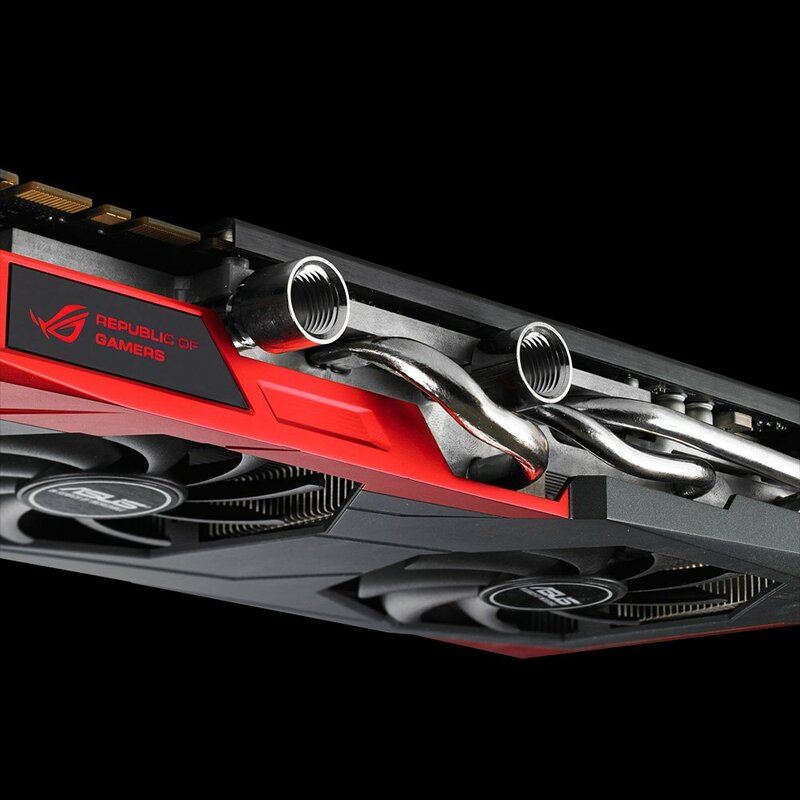 So you’re surfing the web for an Asus GTX 780 review, right? Well look no further because I’m going to be explaining all of the benefits of adding this card to your PC build. Well with this card you’re going to be able to do just that. 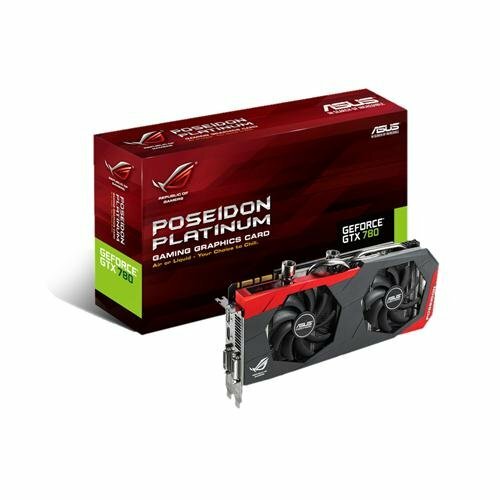 This card packs quite a powerful punch and it’s a steal at its current price. Be prepared to being able to run all of your favorite games at 2560 x 1440 resolution with no problems at all. This is an amazing graphics card. If you’re at all interested in a super high performing premium card that is also fully compatible with water cooling then this is most certainly the video card for you. If you’re not planning on water cooling your system then you can just enjoy the benefits of having an extremely powerful card. The fans do just fine in cooling the card at its stock power level, which is insanely powerful. These tubes allow for water cooling capabilities. This card has a 1006MHz Boost Clock. A Boost Clock basically replaces the core clock so that the card can reach optimal levels of performance while doing tasks that require a lot of graphical power. This combined with the 2304 shader processing units along with the 3GB of video memory makes this card a beast video card. The Asus Poseidon is 140% cooler and 3X quiete than similar card because of the ASUS exclusive Direct CU H2O thermal solution inside of the card. Direct CU H2O technology evokes a combined air and water channel to provide 100% flexibility for the user. A custom vapor chamber is in direct contact with the cards’ GPUs for faster heat dispersal, while copper heat-pipes and extended cooling fins further transfer heat out and away from the cards to keep them running cool. This ensures stellar performance with this card. Manufactured in Japan, this card is made of black metallic capacitors which also gives 20% better temperature ratings and 5X longer lifetime usage. They really went all-in on this card to make sure is was one of the best For a GeForce GTX 780. This is a very high-end version for a smaller cost than most. Asus GPU Tweak software allows you to tune graphics card performance and check card status via an easy-to-use interface. This allows you to see the temperature and the core speeds that are presently running with your card. This software allows you to change these depending on what you prefer to have out of your card. This makes overclocking a lot easier to do with this card. If you have/ plan to use a water cooling system with your PC then you’re going to be able to overclock this card to make it unstoppable. This is what the GPU tweak interface looks like. With this you’ll be able to overclock your GPU with no issues. All in all, if you’re looking for a premium card that’s going to allow you to not only run today’s games on max but also all of next years games on max settings then I highly suggest that you consider getting this card for your build. By getting this card you’ll also be setting yourself up perfectly for when Oculus Rift (virtual reality) decides to take its course in the gaming industry. The future of gaming is coming very soon and this card is totally going to allow you to get the best experience out of it. So what do you guys think of my Asus GTX 780 review? Are you going to be purchasing this card for your present/future build? Tagged asus gtx 780, graphics card review, gtx 780, video card. Bookmark the permalink. The Asus GTX 780 sounds like an awesome piece of hardware and the graphics card is certainly something that all gamers should add to their “must have” list. I’m happy that I could help educate you on computer hardware! And yes, any gamer would be more than THRILLED by grabbing this card for their PC rig!